We had to consciously break out of the chains-that-bind and get our Cruiser Mojo revved up again. There's nothing like doing boat chores and laundry to do that for you... After a day of backbreaking work, we consulted our charts and took a look around. We needed groceries and the little store in Leverick bay is so expensive. We had heard that there was another store a short walk up the hill from Gun Creek. We motored the less-than-two mile distance around the corner and found a sandy spot in about 25 ft to drop the anchor. We were on the "wrong" side of the anchorage... the lee shore, but there were several boats across the ferry channel and we were only staying a short time. The dinghy dock and our BIG bag of trash! We know we're really back in Cruiser Mode now because before we went ashore we had to redo the chain-to-rope splice on our anchor rode... Boat chores never end... AND because we're once again blazing new trails. Gun Creek is kind of off-the-beaten-path. 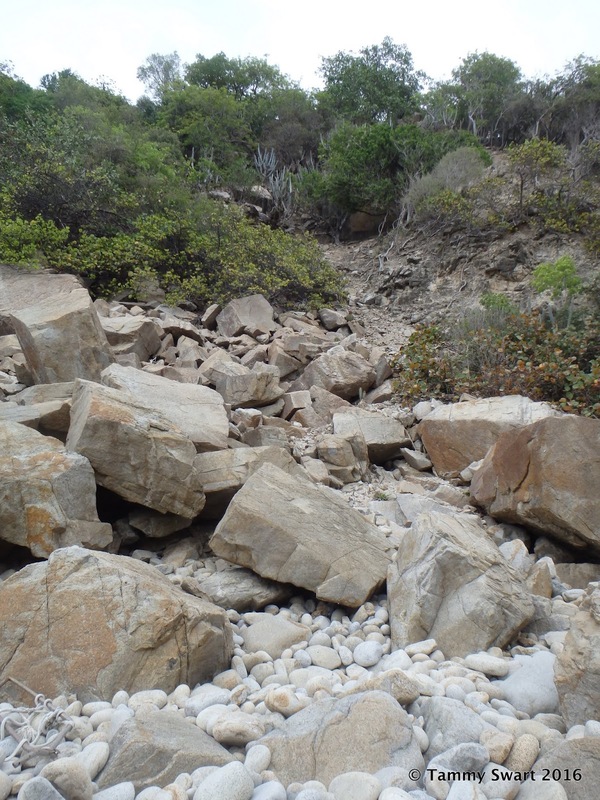 You can't see it unless you're looking for it and it isn't glamorous like so many of the BVI anchorages. There were people hanging out in the shade outside the Customs & Immigration office who directed us where to deposit our huge and stinky bag of trash (for FREE - I think they just didn't want to mess with collecting our money...) and pointed the way up the road to the Buck's Market. For those of you taking notes, you go up the road and turn right at the T, then as the road curves off to the left, you exit to the right where the power poles are. Go down a steep hill where the pavement ends and curve around to the left until you see the Bucks Market to your right. This market really did have better prices than the stores in Spanish Town and Leverick Bay. We picked up a few things, including two bottles of Pusser's Rum ($13.99 each - everywhere else in the BVI we found them for nothing less than $15.99). We have always wondered about the high prices for groceries on these islands. Are the residents really paying this much for sustenance? How CAN they??? Now we know that while prices are still not CHEAP... there are places to shop that are more reasonable (read: less shocking). 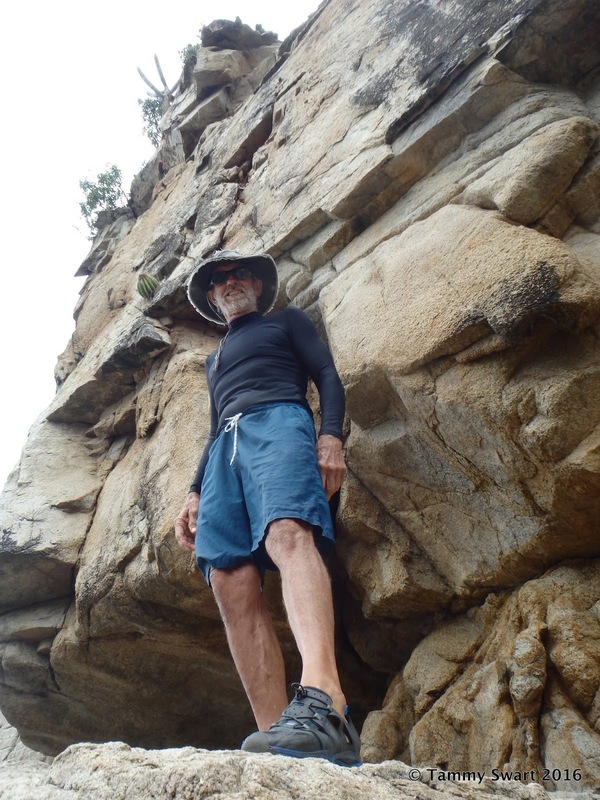 We returned to the boat and hauled anchor to make another short jump across North Sound to Prickley Pear Island. This is another place we've never visited before... in fact, we've never been to Saba Rock or Bitter End either!!! We briefly considered going over to Saba for their happy hour and to see the tarpon feed... but at this point we both needed a little down time. We had been running with our friends all week and that's not normally how we cruise. We take lots of breathers and just enjoy the scenery between spurts of activity. We relaxed for a while before taking the dinghy to the beach for a walk. 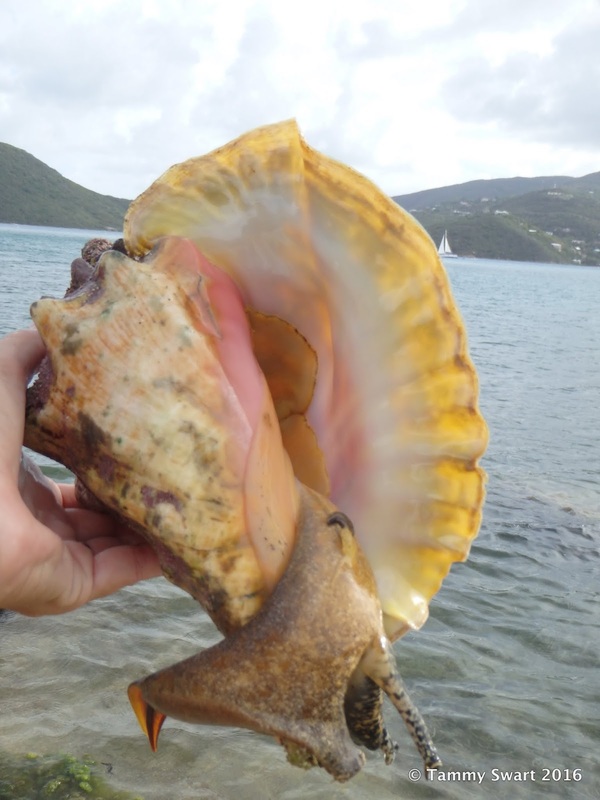 We found a conch shell with somebody living inside. For one brief moment we considered taking him and trying our hand at fresh conch... Naaaa... Conch just isn't good enough to warrant the work. Taking matters into his own... foot?... he began waiving around trying to turn himself over... his toenail scraped against my hand in a totally creepy way! EEEK!!! Ahhhh he touched me with that cold scratchy claw!!! We met a group of young people (30-somethings?) on the beach and answered their questions about cruising... They were from Louisiana... never met a Cajun we didn't like... We left them alone and walked back along the otherwise secluded beach to our dinghy. It's funny how you figure things out and wish you had long ago... With the prevailing wind, this anchorage is superior to Leverick bay. The water is flat but the wind still blows through to cool things down and keep no-see-ums away. If you don't need anything from Virgin Gorda... hang out here! And the sunset is better! In the morning we took our time getting ready and hauling the anchor. We couldn't decide where to go! So many choices! We expanded our search area and chose another little bay that isn't on the Charter circuit... Lee Bay. Now keep this to yourselves if you can... I totally considered lying and not telling anyone about this place so that it won't become crowded and lose it's charm. There were three boats there when we arrived but two of them were leaving. We motored in closer to the beach than the other boats, checking the depths should we swing toward the shore (unlikely) and attempted to anchor on the northern end... but after three tries with the anchor just bouncing along the bottom, we moved toward the middle and found a sandy spot deep enough to hold us. When we checked the anchor with the lookee bucket, we found it in the proper position and dug in, but not deep, so perhaps the sand is only a foot or so deep over rock. But, with the wind coming over the island and protected by hills, even with brisk winds we felt secure... and in two days never moved. After our nap (hey, cruising is hard work!) we dinghied over to explore our beach. 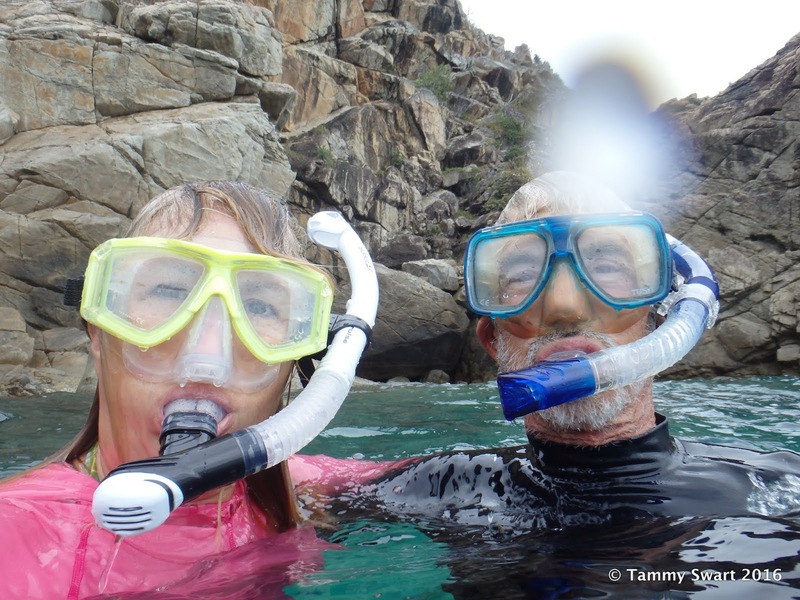 We took our snorkel gear with us... not expecting much... and were pleasantly surprised! This was better than Monkey Point! Again, lots of snorkel pics! New sighting, some kind of worm! New sighting, busy little creature. Lobster's distant cousin? I can SEE you! You aren't hiding!!! Not a great pic... but EEEEEELLL! The next morning we had to do some minor problem solving. Remember our refrigerator is out of commission? Yes, how can we survive and why am I not losing my mind over this??? We've got a freezer and it keeps the majority of our delicate food cold... and we've been buying ice to keep the (now) ice box cool. There being no store here in Lee Bay, we had to figure something out! So we get to visit Marina Cay after all! A (long-for-us) dinghy ride away back around the south end of Great Camanoe and we have the fuel dock at Marina Cay! So we take our gas can and our cooler bag for the ice, I get a shower and put on civilized clothes so we don't look like Cruiser-Riff-Raff and off we go. I stood up, turned around with the dinghy painter in hand and began pulling the dinghy closer to the dock... and the line just kept coming... I lost my balance and took a step back... and there WAS no step back! I fell right off the other side of the dock into the water! Fully clothed! With my little backpack (iPad inside) on my back! KerSPLASH!!! Unfortunately there were no pictures of this! I came up sputtering and gulping down the water that went up my nose. Very SALTY water! My sun visor was floating away, my backpack soaked! I quickly removed the iPad, luckily the waterproof LifeProof case DOES work! I looked around, laughing to see if there were any witnesses I would have to kill... Bruce was staring at me open-mouthed like he was waiting to see if my head was going to spin around and flame spurt out of my nose! I couldn't tell by the body language of the folks fueling up down the dock, nor the attendant... that they had witnessed my shame! So I sent Bruce on to get the gas while I sat myself safely in the dinghy to consider my position. He returned and convinced me to come into the Pusser's Store with him... dripping wet. Soooo... with gasoline and ice onboard, we returned to our boat to find something to do with the rest of our day! Thank GOODNESS we moved to the southern shore and found a little cove to anchor the dinghy!!!! 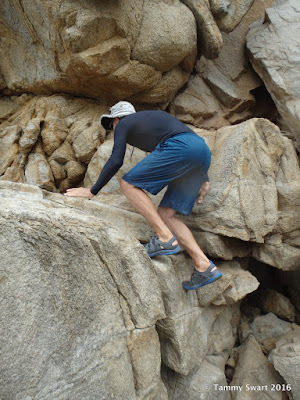 There was still a bit of surge so we stopped short of the rocky shore. There is a sort of ravine cutting down the rocky face of the hill here that is piled with strangely uniformly oval shaped rocks... like river rocks! There are all sizes and they are wonderful. My parents would have had a truckload of these if they could! 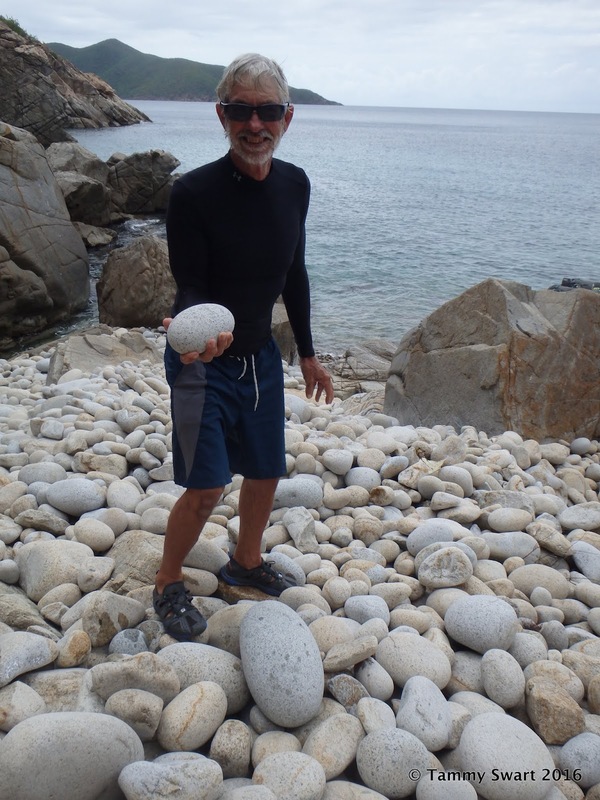 Bruce anchored the dinghy aft to keep it off the beach, then took the forward line to shore and secured it to a rock. Under the surface, it began looking similar to The Baths. 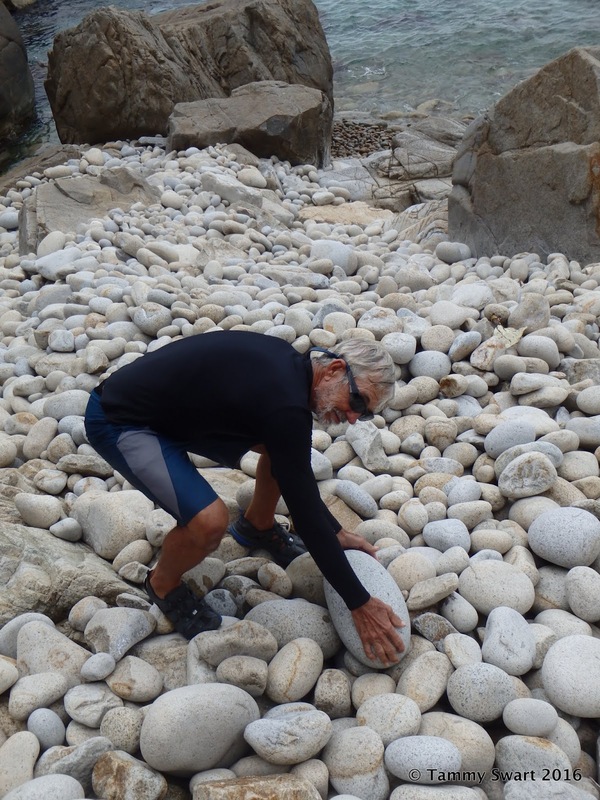 There were huge boulders tumbled into the water and we swam around them. More snorkel pics below and a couple of videos at the end. We saw some fish we hadn't seen before and they were all just going about their day... paying no attention to us. I honestly can't identify these fish, I've looked but haven't had any definitive luck... Moving on... We began to get cold so we turned our attention to the cliffs rising from our snorkel grounds... I LOVE rocks! And I love climbing around on them! The end of the road - do not try this at home! But our zen was momentary as my eye locked onto what looked like a shallow cave on the cliff opposite where we were... I must see what's inside that cave! When I told him I had my eye on another rock climb he balked. He sat himself on a rock and was happy to let me go on without him as I climbed the ever increasingly difficult rocky pile. How am I going to get up that last bit...? When Bruce realized that there was a CAVE (he never listens to me when I speak) he hastily made up the distance between us. He reached me just as I was wondering how I was going to manage that last big step... Then he just scrambled up that rock like a goat and was on the ledge above me looking down! Help ME!! I can't do it!!! Once again we stared around at the amazing world that is ours. These are the moments that keep us going. When things break, and it's hot, or the seas are big and bad... we remember that this is what is in store for us if we persevere. The way back down was much easier of course... only a few scuffed places on my rump and we're back to earth. Our next stop IS on the Charter circuit... but we didn't stop there last week. It is one of our very favorite anchorages in the BVI... Cane Garden Bay! We set sail... yes... I said SAIL! We turned off the engine moments after raising the anchor and just ghosted right out of there. Suddenly we were hit by a gust and the boat leapt forward. We were moving along at over 7 knots! Woo hoo! Thank goodness for the cockpit enclosure! 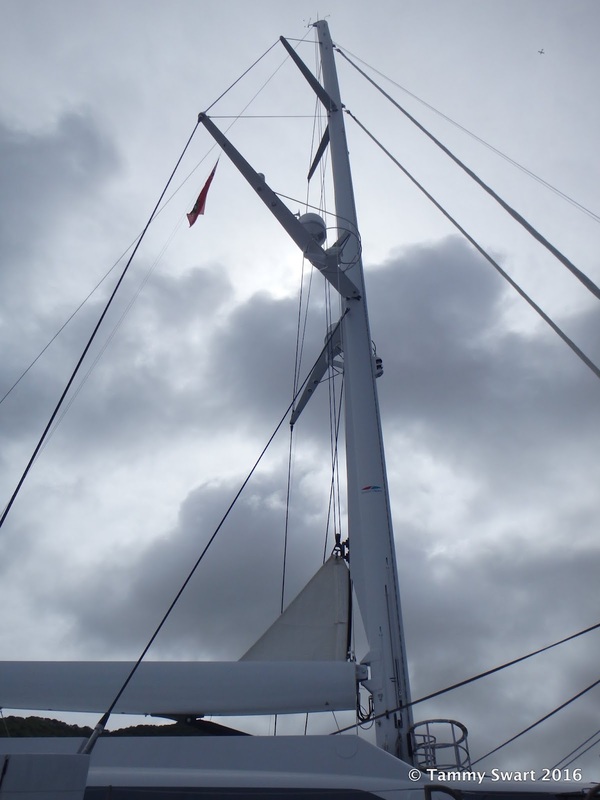 Our point of sail in relation to the wind and waves was still comfortable, even with the gusts. Very soon a spot of blue sky heralded the passing of the squall and things settled down nicely, just in time for our final approach to the narrow cut in the reef that protects Cane Garden Bay from swell. We have always taken a mooring ball in Cane Garden Bay, but there is plenty of room to anchor. In fact, I think the spot we dropped the hook was in better position than most of the mooring balls. We got right up close just outside the swim area in about 15 ft with good holding on a nice sandy bottom. It was strange looking at CGB through the eyes of a Cruiser. First, there's the anchoring instead of mooring. Secondly, we needed some provisions. We've never had to buy food here before... We were happy to see that there was a Bucks Market here AND a new place that just recently opened up. A little competition never hurts! This spot is on the right just after you come up to the street from the dinghy dock. Open late! Bucks still has the best selection for most things though so after picking up some ice and bread at the new place, we did a little more extensive purchasing at Bucks. 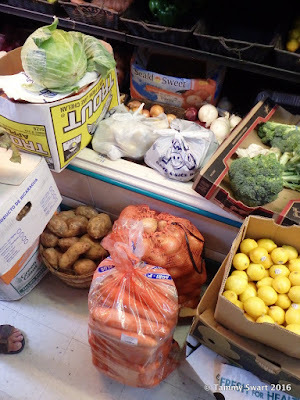 They had the most AWESOME veggies that were just going onto the shelves when we arrived. We learned a lot of things from our conversation and even met up with them the following morning to buy a Sea Eagle inflatable kayak from them... We had some fun learning to drive it in the calm anchorage. But into each Cruiser's life a little (a lot) of laundry must come... Not only was Cane Garden Bay a good place for grocery shopping, it also had TWO laundromats within walking distance. We took our two big bags of clothes to shore and spent the morning watching the three big machines churn. There was another couple that arrived shortly after we did with two very sweet little kids. Unfortunately the tiny boy had a RAGING case of pink eye.... and both kids had sticky suckers that they were practically bathing with. I kid you not, they would get the sucker wet in their mouths and then rub it on their arms and hands... and then they wanted to come hang out with US!!! OH NO!!! My germ-phobia was going NUTS! So... as soon as the washers were done, we loaded up our wet clothes and went back to the boat to hang them out to dry. Oh well... saved us a few bucks! 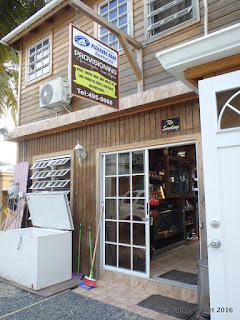 It was while we were in Cane Garden Bay that I learned of a refrigerator Repairman here on Tortola. With the AT&T data plan on the iPad working this close to the USVIs... I was able to arrange for a visit and a slip in Nanny Cay. 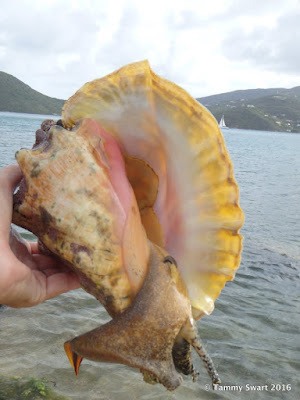 So the next morning (Sunday) we regretfully left Cane Garden Bay and began another feast-and-famon sail around the West end of Tortola and back up the other side to claim our slip in one of the neatest places we've been to in the BVI. Nanny Cay Marina has a well fortified entrance lined with a rock breakwater that made the waters inside the basin flat and calm even though there were some bouncy waves just outside the entrance. Our slip was on A Dock and very close in to shore so our walk was short. There was plenty of space between the docks, although there were some BIG boats there that stuck out into the fairway. I worried about getting out when the time came, but it ended up being easy with light winds and most of the big boats had moved away. Lucky! Couldn't get it all into one picture! Upon arrival, we made ourselves at home thinking we would be here for one night and then leave. One night turned into three because it just works out that way. I was able to FINALLY meet one of Sailing Blogdom's most brightly shining stars... Brittany from Windtraveler! AND her more-adorable-in-real-life little girls! Yes I have arrived! We had a pool date with Brittany and the girls. She is so sweet and welcoming and the girls are constantly moving and really good swimmers! Yes, as busy as these babies are... I got some snuggles! Nanny Cay Marina and the surrounding area have just about everything a Cruiser could want. We enjoyed our walks and some shopping. There is a RiteWay Grocery on the grounds and a C&D Grocery outside on the main road to the left within easy walking distance. There is a nice little chandlery a bit further down the road, Wickham's Cay Riggers stocked with an extensive variety of sailing baubles. 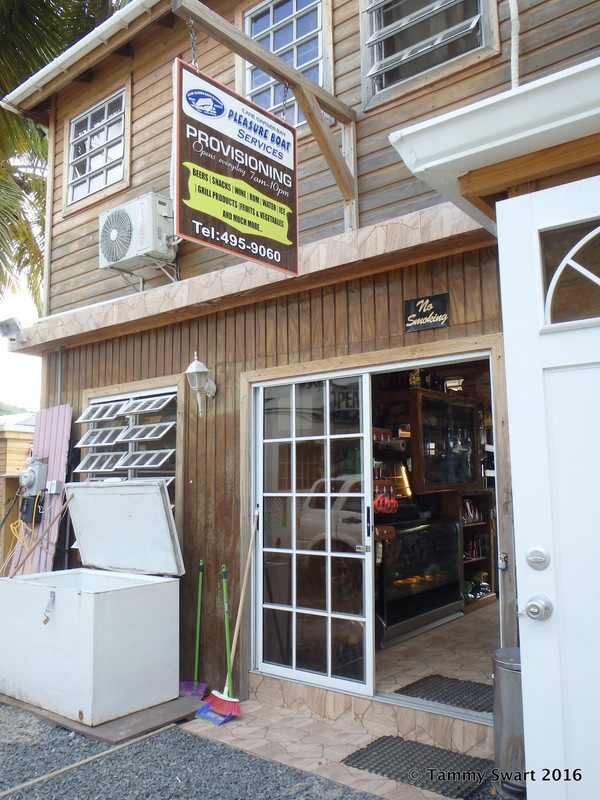 There is a Yamaha place and a Budget Marine Store on the premises as well... And a boatyard... AND Alfred's AC & Refrigeration Repair! Oh yeah... we're here to get our fridge going again... I remember! There were no tears this time because we will be back soon! Being on our own boat in the BVIs has been a dream come true many years in the making. Thanks for the tip on the grocery at Gunn Creek. Our boat is currently on the hard at Nanny Cay and we will be returning to it next month, at which time we will be heading to Leverick Bay (and probably CGB also). I have been enjoying your blog and hope that someday soon I can meet you and say hi! You're welcome! We will be heading back that way in the next month time frame so maybe it will happen! We love to meet up with Blog Friends! Give us a shout on Facebook if you can when you see us headed your way. Meet us at Myetts!!! Sounds like a plan! And if not then- I'm sure our paths will cross sometime in the future. We will be full timers come November 1st.